You may be familiar with Pipe Organs, from the fairly modest instrument in a local suburban church to the magnificent and powerful Sydney Town Hall Grand Organ with its massive 64-foot pipes. But you may not be so aware of another kind of Pipe Organ—the Theatre Pipe Organ. Developed purely for entertainment, rather than for worship or classical music, Theatre Organs were installed in dance halls and movie theatres, and even a few skating rinks! But instead of building the pipes into a decorative casing in full view as is usually the case with a “Classical” organ, all of the pipes were placed in chambers, out of sight, with ornate plasterwork grilles allowing the sound to fill the auditorium. Only the console would be visible to the patrons, mounted on a side wall, on the side of the stage or very often mounted on a hydraulic hoist so that it rose majestically from its pit into the spotlight for the performance. This unique instrument could replace an entire orchestra with just one musician! Sets of pipes (called ranks) imitated the various tone families of the orchestra: Strings, Woodwinds, Brass. Percussions are also included: Drums, Cymbals, Wood Block, Triangle, Glockenspiel, Xylophone, Cathedral Chimes, Sleigh Bells etc. These are real percussion instruments, played from the console. At first, the Theatre Organ was used to accompany silent movies, and many “sound effects” were included to enhance the movie experience—all the bells and whistles! With the advent of sound movies, Theatre Pipe Organs fell into disuse but some were saved by private collectors or by Theatre Organ preservation groups such as the Theatre Organ Society of Australia (TOSA), which began in Sydney in 1960. TOSA acquired the Wurlitzer Organ from the Prince Edward Theatre and installed it into Marrickville Town Hall, Sydney (the first ever of such an arrangement with a Council, since followed by many.) 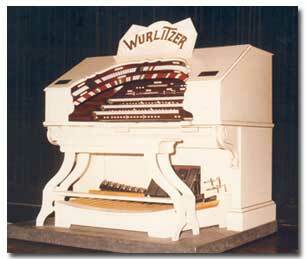 Later, the larger Wurlitzer from the Capitol Theatre was acquired and was eventually rebuilt and installed into the Orion Centre in Campsie in south-western Sydney. A third Theatre Organ, a Christie, is currently undergoing a complete restoration and enhancement ready to be installed in its new home at the West Ryde Anglican Church (St Columb's). The two operational theatre pipe organs that TOSA NSW owns and operates are the only authentic theatre pipe organs currently used for publically accesible shows and concerts in New South Wales. All organ sounds heard by the audience are created using the combination of electrical activation of pneumatically powered valves. A third organ will be playing in the near future. This is a Christie Cinema Organ that is being fully rebuilt, updated and installed in West Ryde Anglican Church (St Columb's). It will be available for church use and also for TOSA NSW concerts and social events. Entirely run by volunteers, TOSA is dedicated to preserving these mighty instruments which are so versatile that almost all genres of music can be played on them. Join TOSA NSW by clicking here and downloading a membership form.